So here is my concern, I am planning to install 2 X 2400mhz ram on my gigabyte B360M D3H motherboard but i do have 1 ram stick f 8gb (2666 mhz) installed already. My concerns is should i go ahead and install 2400mhz ram on separate dual channel or should i install only 2666mhz ram. this last bit is important, you failed to mention your CPU, but this last bit indicates if you have a 6th gen cpu on this you will only run at 2400 MHZ. So with all this information what you could/should do is take the single sitck out. this will put your dual channel in priority and use the single channel if it need more. I have install Intel 8th generation i5-8500 CPU on my gigabyte B360M D3H motherboard with 2666mhz ram. Now should i go for 1 stick 2666mhz or can i go for dual channel? Will it ignore my 2666mhz ram ? 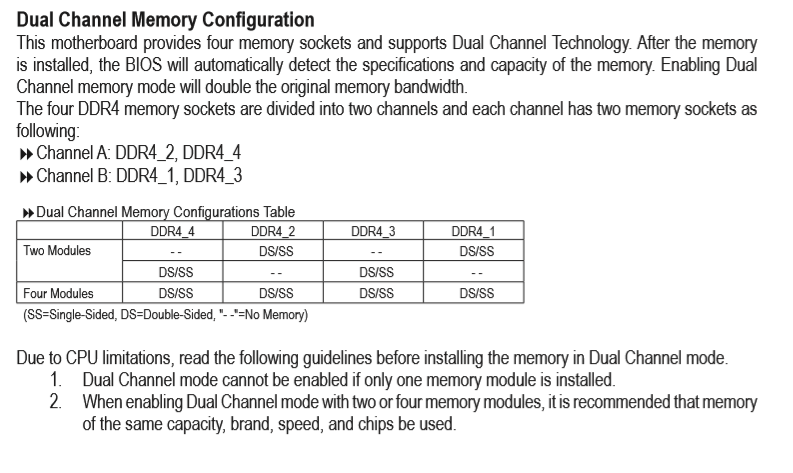 If motherboard supports dual channel, you should always take advantage of it by using the correct RAM configuration as per the chart above. Run the matched pair only. It will give you a ram boost since you will be in Dual Channel mode and intel doesnt really care about speeds that much. You should install a second 2666 stick (exact same make/model) in the dual channel slot for your existing stick. It may not work but has as much chance as the new pair of 2400. Currently i have installed Kinston Hyperx 2166MHZ on this mobo! Any other info needed! any suggestions?